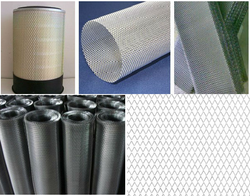 Pioneers in the industry, we offer expandable metal mesh and flattened expanded metal mesh from India. We manufacture and supply a broad array of Expanded Metal which is manufactured using high grade raw materials. Our product range includes Expanded Mesh and Flattened Expanded Metal Mesh. Quality is the first priority of our firm. All the products are manufactured under the strict supervision of experienced professionals, who make sure that flawless range is manufactured at our end. Our team comprises experienced and dedicated professionals, who work in close coordination with each other to achieve the goals of the organization. We have developed a sound infrastructure that is equipped with modern machinery and tools. This enables us to meet the bulk demands of our clients promptly and efficiently. Flattened expanded metal is the same product as Standard Expanded Metal, but has been cold rolled by a flattening machine to give it a smooth flat surface. The Flattening reduces the thickness (gauge) of the material and bonds it down creating Flat Expanded Metal. Looking for Expandable Mesh ?